The temporomandibular joint is the moving part of the jaw. It works like a hinge, causing your mouth to open and close. The temporomandibular joint connects your jaws to your head. Problems with this important joint cause severe head and neck pain, especially in the muscles of the head, neck and jaw. This disorder also causes stiffness and pain in the jaw, making talking and eating uncomfortable. TMJ causes include arthritis in the jaw, jaw injury and misaligned teeth. People who grind their teeth sometimes experience TMJ symptoms. One of the best cures for the bite disorder is to align properly the teeth once again. Braces of some sort realign the teeth so the bite is appropriate, and the stress is taken away from your jaws. A popular way to realign a person’s teeth is Invisalign. 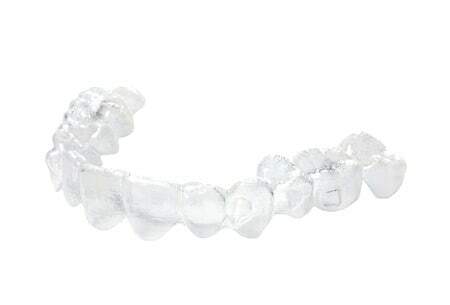 Invisalign uses a series of individually created aligners to straighten your teeth gradually. The aligners look like transparent tooth trays and gently move your teeth over a period. They are not visible, which makes them more attractive than traditional braces. They are more comfortable than traditional braces, as well. When using this method to straighten your teeth, you use a different tray about every two weeks until your teeth are straight. You can thoroughly clean your teeth and care for them as usual without working around metal braces, which keeps your mouth healthier in the long run. The Invisalign corrects your bite with very little change in your looks or lifestyle. Depending on your individual needs, your orthodontist will recommend braces instead of the Invisalign system. You don’t have to use old-fashioned metal braces on the front of your teeth that detract from your beautiful smile. Incognito Hidden Braces are applied to the backs of your teeth. These braces are 100 percent invisible and an excellent choice for straightening misaligned teeth. Incognito Hidden Braces straighten even the most stubborn teeth misalignments. Your smile will shine, and your confidence will grow as your jaws feel better, and your smile improves. A qualified orthodontist diagnoses and treats TMJ problems. Papandreas Orthodontics’ experienced staff has the knowledge and skill to determine the cause of your TMJ problems and to correctly treat the issue, giving you relief from pain and headaches. Contact Papandreas Orthodontics today to start on the road to recovery from head, neck and jaw pain. We serve the local communities of Northeast Ohio and two conveniently located offices in Brunswick and North Royalton.